Penelope Bisbee was born in Fort Knox, Kentucky and now lives and works in Dallas, Texas. Her father was an officer in the military, so as a wee child she lived in Kentucky, Germany, Virginia, and then Texas. She earned her MFA in Painting and Intermedia from Texas Woman’s University in 2008. Her BFA is from the University of Texas at Arlington. Currently, she is teaching Painting I/II, Drawing I/II and Art Appreciation as an adjunct instructor at Tarrant County College and Richland College. 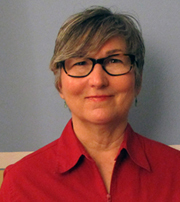 For several years she has been a member of the Dallas area art group Texas Visual Arts Association and currently serves as Secretary of the organization. She exhibits her work locally and has twice been a Hunting Art Prize finalist. When not teaching or creating artwork, she volunteers as an environmental and political activist, rides horses, and carves out time to work on a nascent art park on family land in Knox County, Texas.